The many zoos of Europe each have unique characteristics: the Vienna Zoo is the oldest zoo in the world, the London Zoo was the world’s first petting zoo, the Rome Zoo lies in historic ruins and the Antwerp Zoo is placed in the heart of the downtown area. How to define a new, similarly unique zoo amongst this collection? How should the new zoo in Maubeuge look and feel? What specific qualities should it have? And how to integrate and restore the grandiosity of the historic Vauban fortifications? The many zoos of Europe each have unique characteristics: the Vienna Zoo is the oldest zoo in the world, the London Zoo was the world’s first petting zoo, the Rome Zoo lies in historic ruins and the Antwerp Zoo is placed in the heart of the downtown area. How to define a new, similarly unique zoo amongst this collection? How should the new zoo in Maubeuge look and feel? What specific qualities should it have? And how to integrate and restore the grandiosity of the historic Vauban fortifications it sits within? MVRDV’s proposal for Maubeuge Zoo aims to reveal the heritage and character of the Vauban fortifications contained in the site of the view, and the remarkable landscape around them. 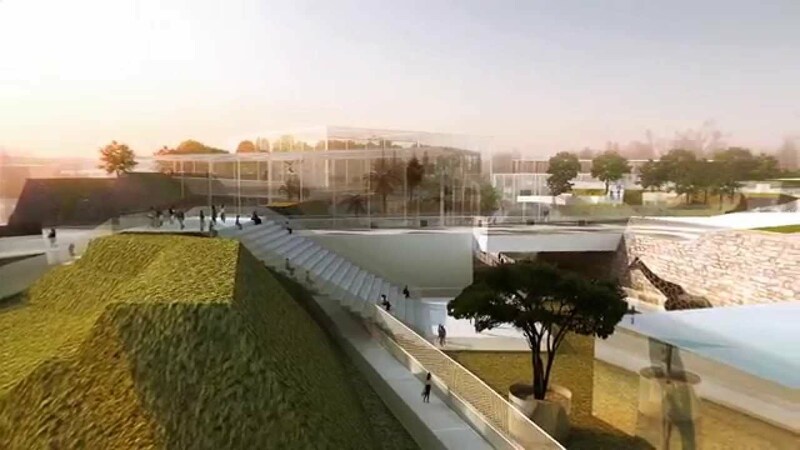 70.000 m2 zoo masterplan including total restructuring with 4.769 m2 of new buildings and programs, and restoration and preservation of historic Vauban fortifications. The park should host an innovative and iconic zoo for the city of Maubeuge, a new source of tourism and culture on a regional, national and European level. The Vauban fortifications have been transformed and distorted significantly over time. They have many of their characteristic details specific to the military architecture of the time. MVRDV considers the project as an opportunity to rediscover those characteristics and enhance them through careful interventions in the historic walls; to pay tribute to the landscape designer Sebastien Le Prestre de Vauban, who designed the fortifications in the 17th century. Careful analysis of the historical documents and the existing site makes several changes obvious: the original ditches have lost their readability, the secondary tenaille elements have disappeared, and the fortification’s walls have not been systematically maintained, particularly near the bastion. Given this situation, it seems clear that the site needs to be restored towards its original beauty so as to preserve a significant part of the "iron belt", a line of fortifications that has protected borders of the Kingdom of France since the time of Louis XIV. In this extraordinary historic context, everything here today is imported: animals, plants and decorations. While a zoo is a place for visitors to discover plants and animals and to become familiar with them, there remains the strong historical context of a structured, designed landscape which remains the main characteristic of the site. The new design of the zoo should inhabit this landscape without distorting it: new programs and pathways must sit moderately. The foundations of the new zoo should be shallow and reversible so they can be easily removed, the building structures should be modular and demountable, preferably made out of metal and glass. The zoo should become a living place where multiple and exotic natures can express themselves in the scope of the geometry of Vauban’s landscape.